Two weeks ago I bought one too many containers of ricotta for our favorite lasagna. It was fast approaching its expiration date, and because I hate for anything edible to go to waste, we added it to our pancakes this weekend. Along with lemon zest and lemon juice and fresh blueberries. Simple and tasty Sunday breakfast! The ricotta makes the pancakes soft and creamy, and the lemon really shines. 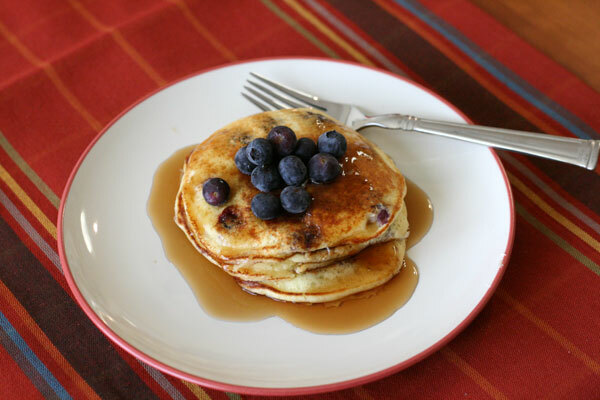 A drizzle of maple syrup and a handful of blueberries on top, and we’re ready to start our day! Combine ricotta, milk, egg yolks, lemon zest, and lemon juice in a large mixing bowl. Whisk to combine. Add cake flour, baking powder, and salt, and mix just until incorporated. In a separate bowl, beat egg whites on medium-low speed until foamy. Increase mixer speed to medium-high and continue to beat, adding sugar gradually, until soft peaks form, about 3 minutes. Fold 1/3 of egg white mixture into ricotta mixture with a spatula until completely incorporated. Fold in remaining egg whites until mixture is smooth and light. Heat griddle or skillet over medium heat, and grease as needed. Ladle batter onto cooking surface, and cook until bubbles form on the surface. Flip with a large spatula, and cook the other side until light golden and cooked through. Repeat with the remaining batter. This is a GENIUS idea! Ricotta and lemon is a winning food marriage. YUM,YUM, YUM! I’ve never done ricotta in my pancakes, but now I may have to. Love it! Pancakes? 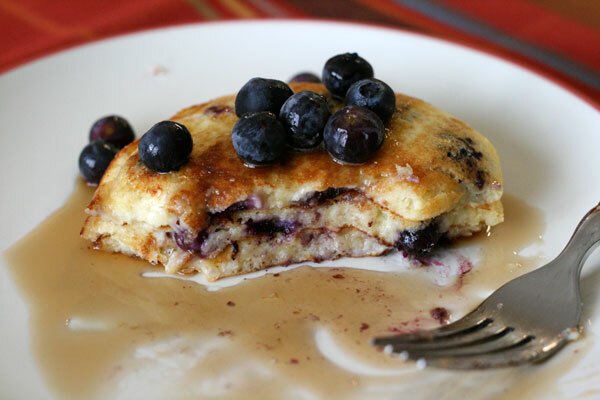 Those aren’t pancakes, they’re too damn small…but they still look good! I wish it was the weekend already so I could make these!!!! We had these for dinner tonight and they were delicious!! I love breakfast for dinner! Glad you enjoyed them.